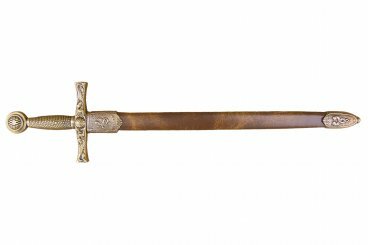 Letter opener King Arthur sword made in metal. The story of King Arthur is intimately linked to the magical and mysterious Excalibur sword, whose name means "Cut Steel", which was one of its many properties. It was also said that the sheath of Excalibur possessed the ability to protect whoever carried it, preventing it from being damaged or injured. There are several legends of how Arthur got this mythical sword; There are two main versions that stand out above the others: the first one states about Excalibur as the sword drawn from a rock by Arthur, and the second version, as the sword entrusted to the young king by the Lady of the Lake. In the first version, which relates Geoffrey of Monmouth, it is said that upon the death of King Uther Pendragon, Merlin forged on the island of Avalon the mighty sword Excalibur and buried it on a steel anvil on a rock near St. Paul; Who could draw the sword from its bed, would be the legitimate king of England. When the young Arthur arrived at the age of sixteen, his father took him and his brothers to London to participate in a fight between knights. While he was looking for a sword for his brother Kay, Arthur held firmly to Excalibur, and as he lifted it, the blade slipped smoothly. And so, automatically, he was crowned King. Feel part of the medieval battles next to King Arthur and the Knights of the Round Table! Epoch: Medieval Europe VI-XV C.